- 4 cuttlefish, - 100 grs. of onion, - a bunch of parsley, - 1 zucchini, - 400 grs. of rice, - salt and - olive oil and - white fish stock. Step 1. Get the cuttlefish prepared: It should be done the day before. Clean and rinse under water, separate the body from the rest, leave the inks aside and the inside juices also aside. Step 2. Roll the bodies of the cuttlefish and place them in the frezzer. 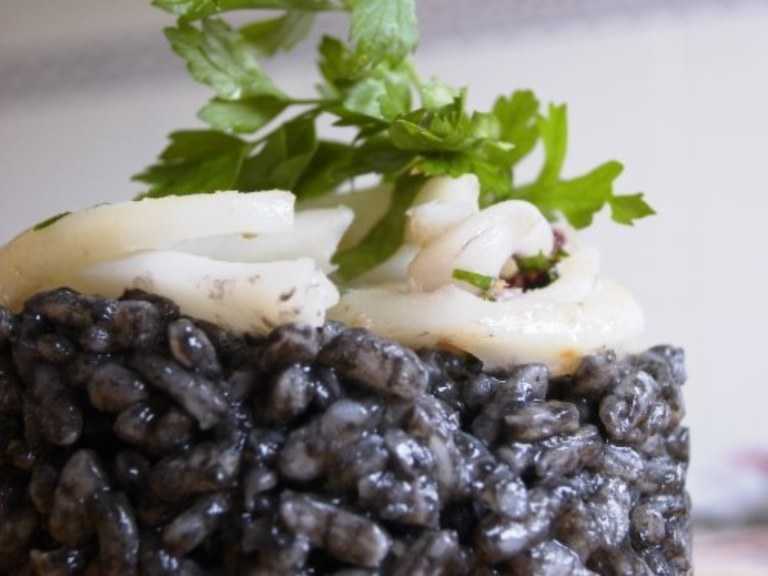 The day you perform the black rice have them out of the frezzer and cut the thinniest you can. Step 3. Chop the onion and place in a pan with some olive oil. The heat should be low. When the onion gets this colour (golden) means that it’s done. Step 4. Cut the zucchini in small dices, prepare a big pan with some olive oil and when it heats, Add the zucchini and stir until it changes the colour when it looks this way means that is nearly cooked. Add the onion to the zucchini when it has also become golden. Step 5. In a small pot with some water place the legs of the cuttlefishes and all the other parts (not the main body). Turn the heat on and have it very low. Make the cuttlefish sweat with the pot covered. When the meat is tender, put away from the heat. Step 6. Stir the ingredients in the big casserole and then add the rice. Let it get all flavours, stir a bit more and in 2 minutes add the cuttlefish legs and its water. Turn heat high. Step 7. Now it’s the time to add the white fish stock. Add to the rice when it’s boiling. If we had 2 glasses of rice (400grs) we should add 6 glasses of fish stock to start with. If it gets too dry you can add more after. Inmediately after, add the ink we have reserved from the cuttlefish (to dilute it, use some hot stock). Add some salt and the cuttlefish juice. Stir. The rice should cook for 15 minutes, being the first 5 high heat, and the rest medium. Let it rest for another 5 when the heat is off and with the casserole covered. Step 8. Have a pan with some olive oil and when it heats throw the cuttlefish in threads. When it changes its colour add a bunch of parsley that you have previously cut in small pieces and some more olive oil, also a pynch of salt.Get a kitchen tin and do the shape with the rice. Place the cuttlefish threads on top and Ready to eat!! !